Once there was a wolf who was walking through the forest, thinking that he was all alone. In his heart of hearts, he had many feelings about this: sadness, sometimes anger, often even self-hatred. He was feeling very unhappy, very unsure, very lonely, but he didn’t know why. He started thinking, "Maybe I have done something wrong. I have never really been a very good wolf. Maybe Creator is angry with me." At the moment he thought this, he heard a voice say, "Wolf", even though he thought he was alone. He was very surprised, he looked all around him, but saw no one, only the trees and shrubs and rough gravel of the path he was following. "It is worse than I thought," he muttered, "now I’m hearing voices in my head. It is just my imagination." He assured himself with these thoughts, but now he was really a little scared, which isn’t like a wolf, you know. He continued to walk, as the dark feelings began to fill him again. He had become so familiar with this darkness inside that he was beginning to think it was part of him, that it belonged there, that it was better than the emptiness in his heart. "Wolf, sit and hear what you must hear!" This time, the voice was a shout, and the wolf knew it did not come from himself, for he was filled with darkness. "Who are you? Are you the darkness, come for me at last?" asked the wolf, hesitantly. "I am Creator," replied the voice, "and you are my child." "Yes, Creator", replied the wolf, who then walked up a small hill just off the path and sat on his haunches in a small clearing where he was bathed in warm sunlight. "Wolf, listen to the words your heart speaks," ordered Creator. "Creator, I can not bear to hear these things," replied the wolf. "Wolf, you will do this, and not just once, you will be asked to do it several times during your journey today. Each time you obey, some of your pain will be left in the place where you sit, it will no longer be your own to bear. It is your choice: to obey, or continue in darkness." "Creator, if I have the strength...," said the wolf. "You have the strength that I have given you," responded Creator. "Then I obey, Creator. I will listen as best I can," sighed the wolf, still not even sure this was really happening. As the wolf sat waiting to hear his heart, memories began to fill his mind, of all those he had known and loved and cherished. He thought of the pups he had sired and how much he had enjoyed watching them play in the sunlight, of his mate and how she had walked in beauty with him on so many journeys. Not even realizing it, he began to cry, which is even more difficult for a wolf than being afraid. "Stand now, Wolf, and continue on your path!" commanded Creator, "Remember what your heart has shown you. Some of your pain remains in this place, forever." The wolf stood, walked down the side of the hill, and continued back down his path. Somehow, the sunlight seemed a little brighter. After a short while, the wolf was walking near a lake, and went down by the rocks near the shore. Again came the command, "Wolf, sit and hear what you must hear!" "Yes, Creator", he replied, and sat on a flat rock near the water’s edge. "Listen to what your heart tells you," ordered Creator. "Yes, Creator," he responded, the fear now subsiding more easily. 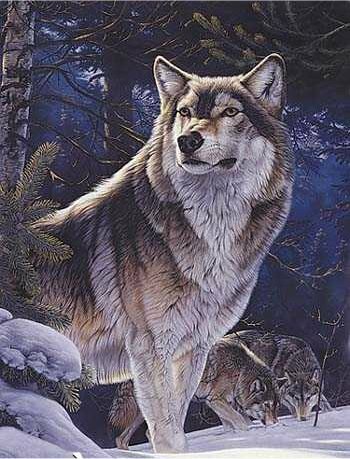 As the thoughts and memories again filled his mind, the wolf began to see the friends he had made in the wolf pack, how they had grown up together, played at hunting, eventually matured into strong, fierce wolves and gone on the real hunts. They had chosen mates, and most had gone their separate ways, but they still occasionally crossed each other’s paths and exchanged cautious greetings. The wolf realized he missed them, and again began to cry. "Creator, they have left me all alone. Why?" the wolf pleaded. "They are part of you and always will be," responded Creator, "Stand now, Wolf, and continue on your path! Remember what your heart has shown you. More of your pain remains in this place, forever." The wolf stood up from the flat rock, walked away from the water’s edge, and continued down the path. Somehow, the fragrance from the woods seemed sweeter. At one point in his walk, the wolf noticed that the path, shaded by a high hedge along each side, was unnaturally dark. As he stepped out of the sunlight, he began to feel rather strange, as if he had been here before. Then he heard a voice. "Return to the darkness, wolf, this is where you belong!" "Who are you!" shouted the wolf, "What do you want? You are not Creator!" "You will never leave the darkness, wolf, and you know it. It is in you. It is you! I have comforted you like no one else. Wolf will never leave the dark! Wolf will never leave the dark!" continued the voice. "No, no, stop. You are wrong. Creator, what must I do?" cried the wolf. But there was no answer. "This is up to me, then," thought the wolf, "this is where I must choose. Be silent, darkness, come to me no more. I do not belong to you, and you do not belong to me!" The voice, though softer, was still chanting "Wolf will never leave the dark! Wolf will never leave the dark!" as the wolf stumbled out of the darkness in his path. He was dazed for a moment, but the warm sunlight pouring over his face felt very refreshing, and soon he was again on his way. The wolf came to a place that was strewn with rocks of many sizes, which stretched on for some distance alongside the path. "Wolf, go into the rocks, and find what you must find!" commanded Creator. "Creator, it is very difficult for me to walk over these rocks. What am I looking for?" questioned the wolf. "Go now, straight into it. Find what you must find," answered Creator. The wolf obeyed, and began walking straight into the wide field of rocks. His paws were hurting as he slipped and slid along, but he continued slowly, obediently. Suddenly, he came across the tail of a squirrel, the remains of some other animal’s hunt. "Wolf, sit and hear what you must hear!" came the voice of Creator, and immediately, without questioning, the wolf sat down, and remembered. Images of his father, who had brought the tail of a squirrel to the den to teach his pups how to follow a scent, flooded his mind. And of his mother, of her gentleness when they were suckling, and of her fierceness protecting them from other predators, snarling even at the huge bear in defense of her pups – of him. He began to cry, this time long, and hard. Once again, Creator spoke to him: "Stand now, Wolf, and continue on your path! Remember what your heart has shown you. More of your pain remains in this place, forever." The wolf, still sobbing, walked slowly over the harsh stones back to his path, and continued his journey down the path. But the forest seemed somehow greener than before. The wolf came to a place where the one path branched into two. He knew that the one to the left led back to where he had started, for he could see how that path curved around, and he was very tired and wanted to return to his den to rest. The other path turned sharply to the right, and was lost to view in the thick wood. So he asked, "Creator, which path should I take?" Creator replied, "The choice is always yours, friend Wolf. But know that the way you have not seen contains a gift, from me to you." "Then I choose the path unknown to me", replied the wolf, and he turned sharply right and was quickly enveloped in the dense forest. He soon came to a point in the wood where the spaces between the trees were filled with strange plants he had never seen before. They were taller than him, maybe four feet high, and thin like sapling trees, but he could see from a few that had fallen they were not trees at all but tapered, hollow stalks, like the reeds near the lake. All were a vibrant green, and pointed toward the sky. As he turned and faced the sun, it seemed as if these plants were suddenly aglow with a glorious, golden radiance. And again he heard Creator’s voice: "Know, Wolf, that all things share the Life I bring: these plants, this forest, those loved ones you have known, and you. I love and cherish you all, and always will. Know, Wolf, that fear, anger, and self-hatred come from your own mind, from the dark thoughts that you once brought upon yourself. Truth comes only from the Heart. Those you have loved are always with you, you are never alone. This is my gift to you. You have learned well today, dear Wolf. We will speak again." The wolf bent down and gently picked up one of the fallen plants in his mouth, to bring back to his den as a reminder to him of all he had been shown. He continued down the unknown path, and discovered that it also led him back home, there had been no reason for his doubt. In his heart, he thanked Creator, and rested in his den, tired from his journey. Soon he slept, and dreamed once more of life, and love, and happiness. Copyright © 2015 by Blue Opal Design, Inc.